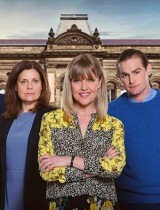 Love, Lies and Records is a BBC One British drama series that revolves around the fate of a woman who works at the town hall and receives a big promotion. Kate Dickenson is a single mother who worked hard to achieve what she has. But with better pay not only more responsibility comes, but also a whole bunch of new problems. Kates life gets more complicated with a whole lot of drama appearing after her promotion. Her so called friends become jealous and turn their backs on Kate, blaming her for all the bad in their lives. The single mother even regrets getting a promotion and tries to cope with all the drama in her life.